Practising Hatha Yoga since 1988, teaching since 1998. A friend took me along to my first yoga class in 1987 – the year I moved to New York City aged 17 to study. 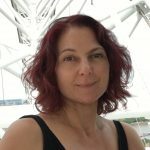 I spent the next ten years exploring various yoga styles and trying out different teachers. I completed my Bachelor of Science in my mid twenties and then decided to train as a yoga teacher. My first teacher training was with the Himalayan Institute of Yoga Science and Philosophy in 1998 and I started student teaching in NYC shortly after. Life events then brought me to Edinburgh where I lived for five years and taught yoga via adult education. In 2002 I moved to Rugby. Here, I continued with my self practice and teaching friends. I took some time out from teaching when I had my daughters in 2004 and 2007 but was keen to resume shortly after. At the time my old Ken Marriott gym membership included unlimited creche. This provided me with time for my self practice and time to teach. 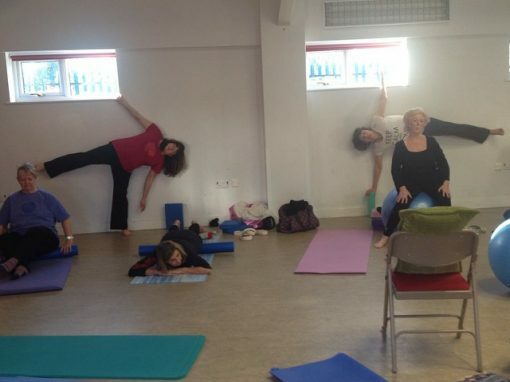 I started covering classes and then was asked to bring yoga onto the timetable. I taught there for a few years before deciding to hire private venues to try and recreate a more conducive atmosphere than what I could achieve in noisy gyms. I feel privileged to have some students who have been attending class with me that entire time – about 10 years now! 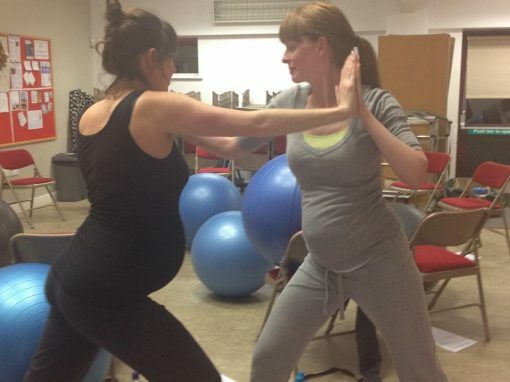 I continued prioritising motherhood but also trying to build my reputation, one class at a time. 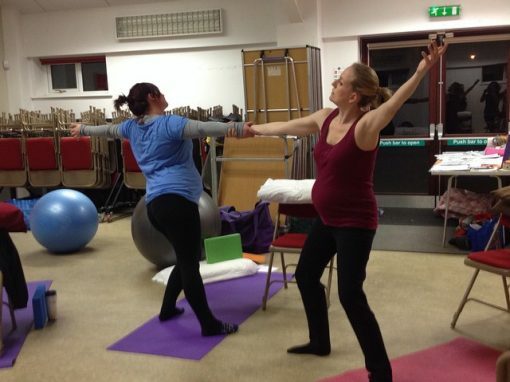 In 2010-12 I trained with Birthlight in antenatal yoga and yoga for labour and birth and have been teaching pregnancy yoga since then. 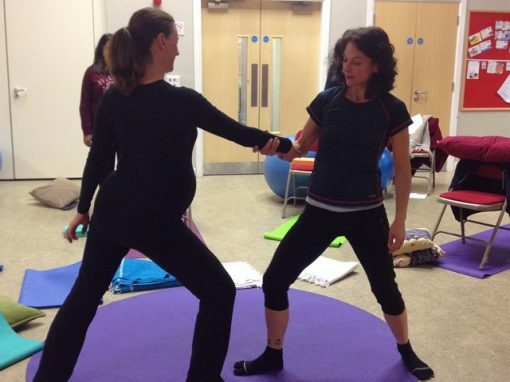 I get great satisfaction from helping women to increase their confidence in their body’s ability to give birth, to enjoy their pregnancy and to give birth the way they want to. 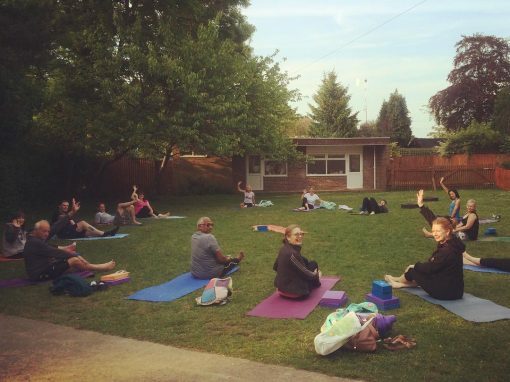 In 2016 I completed my Yoga for Healthy Lower Backs (YHLB) teacher training and became the first yoga teacher in Rugby qualified to offer this gentle, effective yoga for people with chronic or recurring low back pain. I love how Hatha Yoga is so adaptable to all kinds of need. The yoga postures (asanas) keep us physically strong and the breathing practices (pranayama), sound practices (mantra) and guided relaxation (often in the form of Yoga Nidra) are calming for the mind. The overall effect is for both body and mind and has kept me unrolling my own mat for nearly 30 years. 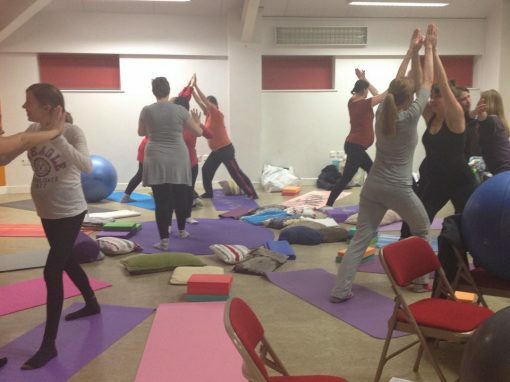 I currently teach Hatha Yoga, Birthlight Pregnancy Yoga and Yoga for Healthy Lower Backs. I have achieved 200hr teacher certification with Yoga Alliance UK and am registered with YHLB, Birthlight UK and an early member of RAYS, the Rugby Area Yoga Society. I am insured through Balens. It is with gratitude that I acknowledge my teachers, from whom, more than 20 years on, I am still learning. You will find a wealth of information on their websites. I won’t aim to reproduce it here. Dharma Mittra is still teaching and traveling the world training yoga teachers after 50 years dedicated to yoga. Dharma is known for his famous poster of 908 poses. Carol and Charles Crenshaw of the Himalayan Institute have over 60 years of teaching between them. Along with Sandra Anderson, Mary and Rolf Sovik and Pandit Rajmani Tigunait (all students of Swami Rama) who inititated me into this tradition with my own mantra. And to Swami Rama who founded the Himalayan Institute in 1969 I give my thanks. Please subscribe to receive newsletters approximately every 6-8 weeks with details of upcoming classes and courses.